You'll be £25.00 closer to your next £10.00 credit when you purchase The US Eighth Air Force in Europe. What's this? 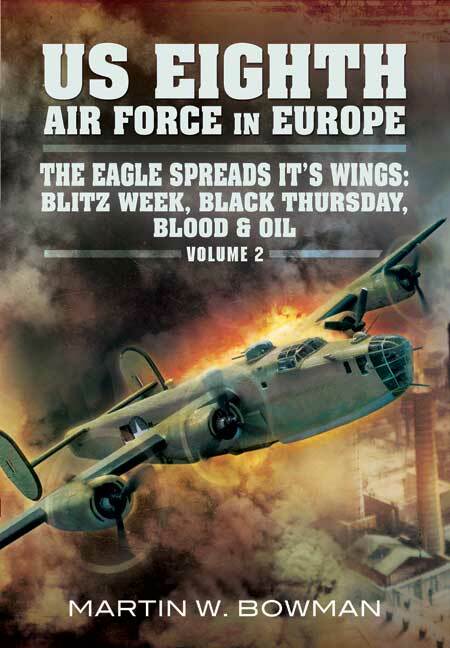 This book describes the period when the American daylight offensive faltered and nearly failed and recalls the terrible losses suffered by Liberators on the low-level attack on the Ploesti oilfields in Rumania and by the B-17s on the notorious Schweinfurt and Regensburg raids which entered 8th Air Force folklore as 'Black Thursday'. Fascinating anecdotes, eye-witness accounts and the hard-won experiences of the battle-scarred American 'fly-boys' reveal the grim realities of air combat at four miles high above enemy occupied Europe, Berlin and the Ruhr. 'Grown up in the war' they paint a revealing picture as only they can. The 'Mighty Eighth' was an air force of hard-fighting, hard-playing fliers who suffered more casualties than the entire US Marine Corps in the Pacific Campaign. Here, in their own words are stories of survival and soul-numbing loss, of 'fly-boys' who came together to fight an air war of the ferocity that had never been fought on such a vast scale before. While RAF Bomber Command was waging war at night 8th Air Force B-17 Flying Fortresses and B-24 Liberators bombed by day in a 24-hour 'round the clock' campaign. This is also a partly a strategic history with a behind-the-scenes look at deployment of the bomber groups and the fighter escorts that would eventually become their salvation on the interminable deep penetration raids into the Greater Reich. This well-known aviation historian and author has written several books using a similar formula, that is to say a collection of first-hand accounts of combat together with a generous sprinkling of solid facts and statistics. The result here is a highly readable account of the early stages of the USAAF air war over Western Europe. This second volume in the series describes the period when the American daylight offensive faltered and nearly failed – and recalls the terrible losses suffered by liberators on the low level attack on the Ploesti oilfields in Rumania. While RAF was waging a war at night, 8th Air force B-17 Flying Fortresses and B-24 Liberators bombed by day in a 24-hour ‘round the clock’ campaign. This is a riveting account of young men fighting for their lives on a daily basis against ferocious by the Luftwaffe. A moving and fascinating work.